John Key explaining why it is a good thing for overseas investors to be buying up New Zealand farmland – and hey, anyway, government is “powerless” to stop these buy-ups. 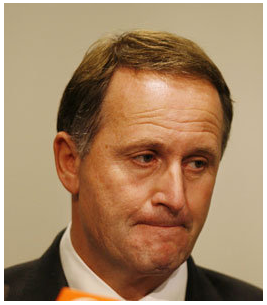 Why should anyone trust a single word to escape from John Key’s mouth? That man has demonstrated on so many occassions that he simply cannot be trusted – he will say one thing, and then later, do the complete opposite. 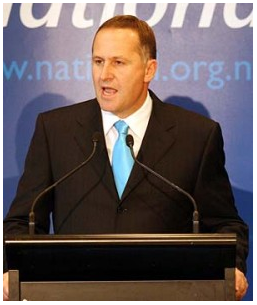 When did New Zealand cede sovereignty to overseas corporate interests? I can’t remember this ever being discussed or debated. Have we actually signed away our sovereignty; our right to determine who we can or won’t sell to? 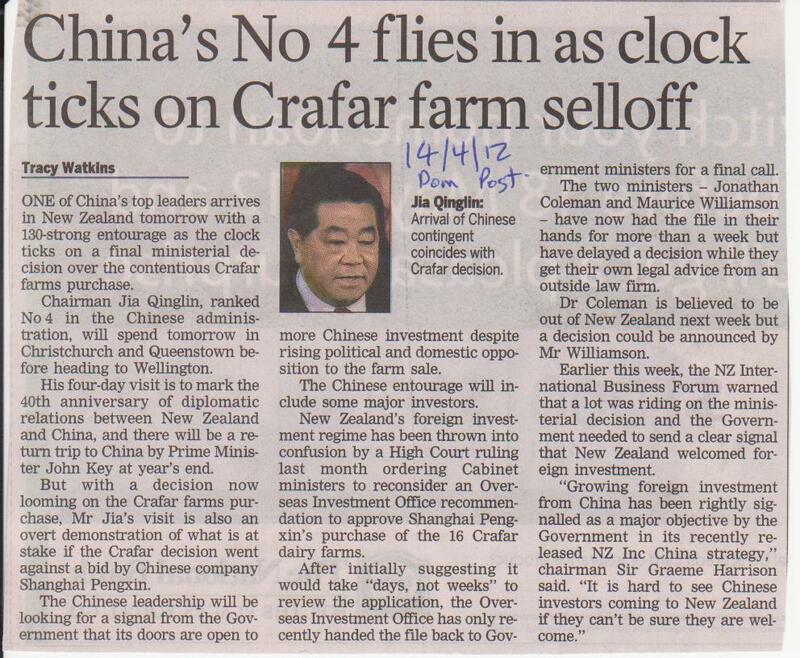 If the NZ-China Free Trade Agreement – that John Key refers to – is constraining us from being unable to stop the sale of the Crafar Farms to Shanghai Pengxin, (and remember – this is John Key talking) – then we need to re-visit those Agreements. Because, as sure as day follows nights – the Chinese do not permit their land to be sold to foreigners. So why are we being coerced into selling our land to them?!?! Does anyone know the answer to this very simple question? Much has been made of the nationality/ethnicity of the buyers of the Crafar Farms. National’s John Key, Maurice Willamson, et al, have played the “race card” in their favour, trying to paint criticism of the buy-up as somehow “racist”. When even a very wealthy man such as Sir Michael Fay cannot outbid a Chinese-government backed buy-up of New Zealand farmland – then we are in very serious trouble. No young New Zealander can hope to compete with German corporations; American billionaires; Chinese government-corporate proxies. In effect, we are witnessing the forfeiting of our farming heritage to our children. And we are allowing it to happen. If this is not sheer stupidity, then I don’t know what it. This is why the governments of Middle East oil-producing regions re-nationalised their oil fields. Allowing oil companies to own the oil fields; extract the oil; process it; and sell it, allowed companies like BP, Shell, ExxonMobil, etc, to reap billions in profits. Meanwhile, the countries upon which the oil fields rested made only a small amount in “royalties”. The Arabs wised up very quickly that they were being ripped off. 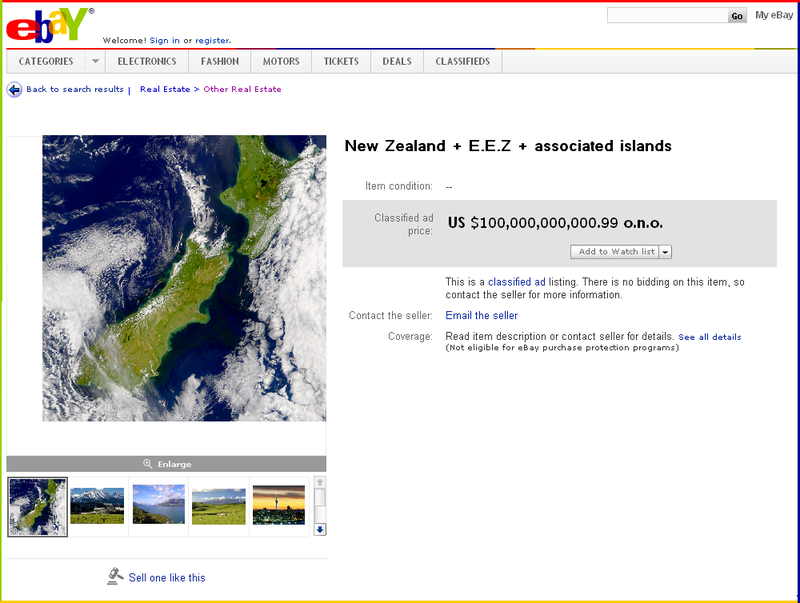 New Zealanders, it seems, still don’t understand what is happening. Is this man a complete fool? Tim Watkin: Crafar Farms deal ticks the boxes – but where does it end?